Whole Foods Corporation, Atten: John Mackey, Founder and CEO: Put "Compassion for Animals" signs on Vegan Product Shelves, Not Meat! This petition has been created by RebeccaMoore and may not represent the views of the Avaaz community. Whole Foods is a corporation that claims to care about compassion for animals. There is one very big problem. 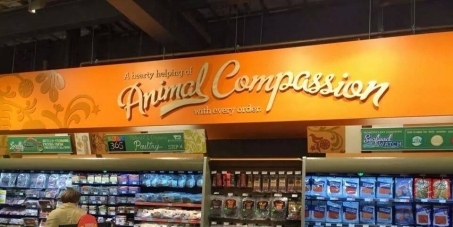 In all Whole Foods Stores, the only place you will see signs saying the words "compassion" and "humane" are, tragically and ironically, in the meat, dairy and eggs areas of the store - products that KILL millions upon millions of animals each year! If the "humane ratings system" that WF employs were used on all foods in their store, obviously meat, dairy and eggs would be at the absolute bottom with the lowest rating (since they kill animals) - - and VEGAN products would rate the highest, as they make compassion the heart of their ethics and mission! We demand that Whole Foods move the "compassion for animals" signs from the aisles of dead animals and products related to their slaughter, and put those signs where they truly belong: on the shelves of VEGAN and Vegetable items!